Hi guys just a short update to let you know I’m still here! I’ve actually been in the UK for the last few weeks and was only in any one part of the country for a day or two before moving on (catching up with friends and family and TWO weddings!) so my internet connectivity was sporadic to say the least! I did get to the gym a lot there, probably visited 8-10 different gyms and saw a variety of different instructors and styles. I would always discreetly come in, hide at the back and ensure I did my best not to put the instructor off by following everything they did rightly or wrongly. As always, some were amazing, and some, were, well… not. One thing I did notice which blew my mind as a Kiwi (as I’ve NEVER seen this happen here) is in multiple gyms, in multiple towns I witnessed BODYATTACK instructors teach with their backs to the class. The first time it happened I was taken aback and thought “wow this person must usually be a freestyle instructor – maybe she’s covering?” and kinda shrugged it off as an anomaly. Then, I went to another gym chain, in a completely different part of the country to do my second BA class and saw it again! Whilst I understand that typically in NZ we don’t have mirrored walls on the front of our studios (in the UK most gyms that I’ve seen do) and this means participants there can see the instructor’s refection in the mirror – I found it odd as this isn’t the way we’re taught to teach an LM programme (or am I wrong and in the UK this is acceptable?) I believe the instructors who do that must do it as they feel it makes it easier for members to follow if everyone is facing the same way, but I think it comes down to what you’re used to as I found it very unsettling to be staring at someone’s back for 55 minutes. Plus, isn’t there an element of connection lost? It certainly must make it harder to correct a member’s technique if you are looking at their reflection and trying to make eye contact that way… And surely it removes an element of the fitness magic as well? I pitched this on twitter at the time and I’ve had loads of feedback about it in the past weeks; ranging from ‘unacceptable’ to ‘this is common where I live too’ – as such be really keen to hear your thoughts on it. I also had the amazing experience of being invited to the UK Super Quarterly Workshop during my visit (thanks Fitpro!). It was amazing it really was. I’ve written a post about that which I’ll post in the coming weeks (or look for it in Kia Ora Magazine if you’re in the UK). It was phenomenal I can’t rave enough about how much fun I had. And, believe it or not filmings roll around in just a few short weeks too! (I know how quick has that been?!) I’ll be sure to post about those as well. Finally, just before I go here’s something interesting. 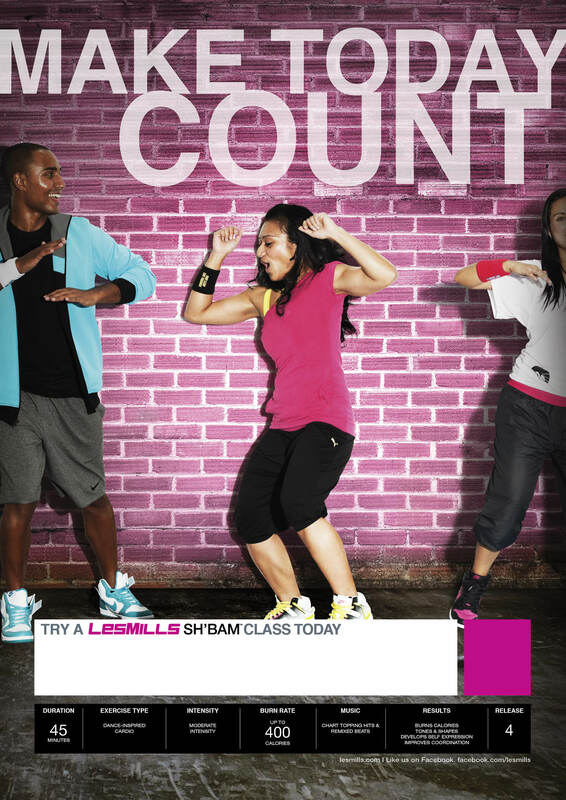 You may recall a blog post I wrote back in January about the calorie count on the Sh’bam poster; Burn rate 600 calories per class. I thought that seemed excessively high given the class is only 45 minutes – that means on a per minute basis Sh’bam burns more than BODYATTACK which to me seemed quite surprising given the nature of the two classes (and many of you commented and were just as surprised as I was). Anyway, a newer poster has since been released (below) so obviously someone agreed with us. Until next time! 20 Responses to "Still here!" I’ve heard some people mention the ‘instructor with their back to the class’ in the LM Forum, but I assumed it was only for part of a track or something to help participants through the chorry if it was a bit difficult? I could never imagine an instructor with their back to the class for an entire 60 minute class – whether is be Attack, Pump or Combat…..
Maybe the instructor(s) had a huge pimple on their nose and were too embarrassed to face the class?? It will be interesting to see if any UK people reply. Yeah Nick it was the whole class! Well, conditioning tracks, running and agility excluded of course. But maybe its common overseas? In Malaysia, for all LM programme, instructors always face members. Only on few times they side or back members to show correct technique or chorey. But for freestyle dance programme like Zumba and Hip Hop, instructors always back members. I instruct in Hungary and the way we tend to teach is different in each class. For my kick box and dance based classes I am always with my back to the guests (sometimes turning to face them for a while), but we have mirrors all around the room so I can easily see everyone and I find it is easier for them to follow the choreo if I face the same way as them. For pilates and classes like body pump I always face the class, don’t really know why, it just feels more natural that way. I guess it’s just what you are used to, but I don’t think either way is wrong as long as the instructor can lead the class well, keep everyone motivated and is able to correct people when needed. I’m in the UK. In my opinion, having your back to your class is just outright wrong! I participate in a BC class and the instructor faces us. And I would never dream of taking a class with my back facing the class. It’s wrong on just too many levels! I can’t believe that would ever be LM endorsed either. Hi Glen, love reading your blog! I’m in the UK and I teach Pump and Combat but also participate a LOT in Attack (I’m gonna be doing module training soon, woo!) and I’ve never know the instructor teach Attack with their back to the class. I’ve known it happen on odd occasions where an instructor will turn so they’re facing away from the class, just while the members pick up a tricky bit of chorey, but then switch back to face the class after a few reps. (I’ve done the same myself in Combat on a few occasions when I could see some folk were struggling to get to grips with a new technique). Have to say it’s not something I’ve experienced in the classes I attend at my local (UK) gym. Like some of the others have said maybe for part of a track in zumba but not in any of the Les Mills classes unless it was side on to show technique but only for a (small) fraction of the track! Certainly hasn’t been a regular thing and not sure I would like it to be either! I’m totally suspicious of all the posters…. Not to offend anyone but I still don’t think Combat could ever have a higher calorie burn than Attack if both classes are done correctly and full on. Hi! in my country, Uruguay, we have mirrors too, but the teacher always faces the class. We use the mirrors to see us and correct our technic. I agree with all of you, who said it’s wrong to have your back to your class, …and also kinda disrespectful. Thanks for your comments guys – I think we’re all pretty much in agreement here! The thing that got me was when the instructors started teaching with their backs to the class I would look around the room with a puzzled look on my face expecting everyone else to be doing the same – but they all acted like it was normal! Glad to see it isn’t! Glad you had a good time in the UK – would be fun to hear what other differences you spotted between UK and NZ gyms. I can’t imagine a gym without mirrors at the front of the studio! But yes, add me to the Brits who have never seen an instructor teach a class with their back to the class for most of the class. Ours only do it when you’ve got some tricky choreography where people are looking confused. Combat can look really cool in those front mirrors when the entire class and instructor are all coming menacingly forward. I’m in America and while it certainly isn’t common over here for instructors to teach with their backs faced…I’ve heard if a few contexts including in front of young adults or special needs persons whom the instructor said simply couldn’t follow the class in a mirror format. Also, there are a couple of combat tracks which I think are a little easier with the back turned…especially Russian Roullete from BC 45. So while I agree it’s not ideal, there are a few contexts where perhaps somewhat appropriate. I saw something similar in a Zumba class a while back. The instructor had her back to the class the whole time, however as there weren’t any mirrors around, she had no idea what her members were actually doing. Hi Glen, I certainly don’t think it is the norm for UK instructors to face away from the class. I agree it is a little unusual and could just be the luck you had with where you visited. I have team taught lots of new releases alongside tons of different instructors and never before witnessed this! Hope people read these comments and not just your post, otherwise everyone will think us in the UK are a little bit crazy. The calorie count has always been a bit of a mystery to me. I teach BC and the calorie count for the class is indeed very much dependent on what you put into it. I know how to do martial art moves correctly to the point where I can put a whole lot of energy into them, but there is no way I can do the whole 55 minutes “full on.” Imagine hitting a heavy bag as fast and hard as you physically can with even just knee strikes (try it in a krav maga class or something) — you are shot after two minutes if you’re really putting in all you can. It’s like sprinting. The point is, there is a theoretical limit to how much energy you can expend in a Combat class, but no way in heck are you going to ever reach it because nobody can sprint for 55 minutes. So, what is a fair “energy level” at which Combat and other classes like Attack should be compared? Who is burning the calories, a 275 lb muscle machine or a 120 lb lean woman or a 160 lb average build man, and is it the same person in each class or are they averaging over the real-world participants in random classes, in which case demographics start to matter? What would be cool is if they told us how many calories the program directors burned in the given release, because we see them and know how much energy they put in. Honestly I was laughing when reading this…what if the members are getting out without the instructor noticed about it hahaha…is he/she going to do the attack alone on stage? I had a French instructor do this in a ‘BodyPump’ class. However it actually turned out to be a copy called ‘BodyBar’ and I left after the warm-up and complained to the manager about it being called ‘BodyPump’ on the timetable. One thing the French do that I’m not sure if you noticed was when they say “left leg”, they use their left leg, whereas in Australia if the instructor says left leg they use their right leg so as to create a mirror effect with the class. It’s very confusing. i’m the only instructor in my gym that teaches combat facing the members. It makes me crazy to see them teach facing the mirror. I asked why the teach like this and they said the members had a hard time doing the moves, so they turned around. I’m thinking maybe its coaching and not the member. I refuse to teach like that.